My thoughts about the Apple announcement | ed. tech. for. me. | ed. tech. for. me. I realize I’m about a week late here, but I have honestly struggled with what to write about last week’s Apple announcement. To say that the announcement was “underwhelming” is accurate. I wasn’t truly disappointed, necessarily, but the event truly lacked the “magic” that we have come to know and love from Apple. By far, the most exciting announcement was that the newest release of Mac OSX, “Mavericks” would be free (Free Mavericks). I’m a little surprised this hadn’t happened already, because the trend had already started. First, it was a $20 price for 5 licenses, then $10, and now free (so number of licenses is irrelevant). This is pretty huge, as it means that users of any Mac laptop or desktop made in the last 6 or 7 years (roughly) can all have the newest version of their operating system. This means that developers can focus more on making quality applications that work on the latest release of the system without worrying too much about backward compatibility. This also means that for schools that are dedicated to Mac computers, the cost for upgrading just plummeted (to zero!). No more do students have to complain about systems that are years behind their personal machines simply because the school can’t afford to put a $20 system on hundreds of machines across campus. As long as the hardware supports it (which my 7-year old iMac is running Mavericks just fine), they can all be upgraded to the latest and greatest. The TCO for Apple machines just went even lower (especially if you include iWork, also now free; more about that below). Not to be outdone by its host operating system, the OSX-only productivity suite, iWork, has also just been made free for all new Mac owners. Again, this is pretty huge for schools. I won’t try to argue that iWork is better than MS Office. It’s better for some things, worse for others. But Pages, Numbers, and Keynote are solid productivity applications that produce some very attractive documents and presentations. If Microsoft came out tomorrow and said that Office is now free, that would be way huger, and this little announcement would be forever forgotten. That said, I don’t see Microsoft doing that anytime soon. So again looking at Total Cost of Ownership, Mac computers are looking a lot more attractive for schools and large businesses. The main reason this item isn’t higher on my list is that it’s a year late. This should have happened at launch, but I think that Apple was nervous that they wouldn’t have any new major updates for their 2nd generation (they were right). 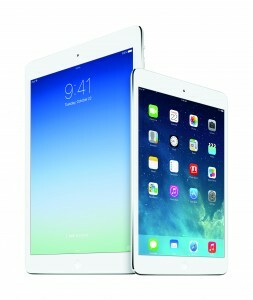 The iPad Mini is a wonderful tablet, which it outselling most competitors in a big way. This just should have been the unit that premiered the device. Same price point as before, but better screen and a faster processor. Really, Apple? Just “iPad” wasn’t enough? Why are iterative numbers like “iPhone 4, 4S, 5, 5S” all acceptable, but iPad 5 unacceptable? You didn’t call your newest iMac the “iMac Razor” or something stupid like that. Sorry… off my soapbox. The newest iPad features a change in form factor (the first since iPad 2), resulting in the crazy-light one-pound device. It is indeed the lightest full-size tablet on the market. Early consumer reviews are very positive and love the new form factor. The benefits of a 64-bit processor in a tablet this size are still in question, but many believe it to be the first step down a longer product evolution roadmap. [pullquote align=”left|center|right” textalign=”left|center|right” width=”30%”]I’m concerned about the ability of Apple to remain competitive if we have to wait another year for major innovation. [/pullquote]Beyond those two features, there’s not much in the new iPad Air to get excited about. The price is the same, the camera is virtually the same. In my opinion, if Apple truly wanted an iPad in every classroom the way they claim, they would not only lower the education price, but also make the camera better. Why should the top iPad model not have the same camera as their flagship iPhone? And please make the Facetime camera full HD.